Hello friends! I don't know about you, but there is just something magical about heat embossing. Every time I start melting the embossing powder I'm just amazed at the coolness of it all! 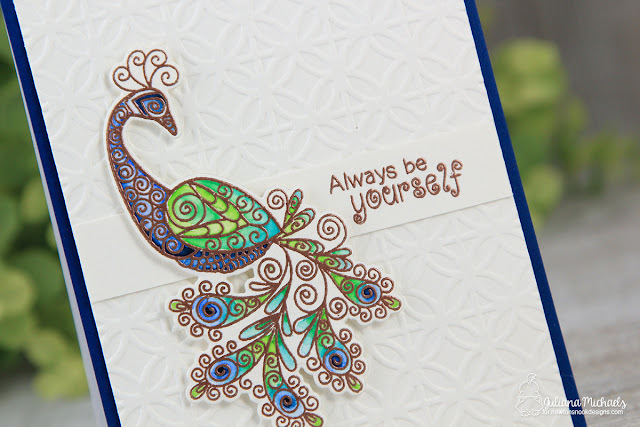 Today, I'm sharing a card I created using the brand new Newton's Nook Designs Beautiful Plumage stamp set with heat embossing and watercolor markers. 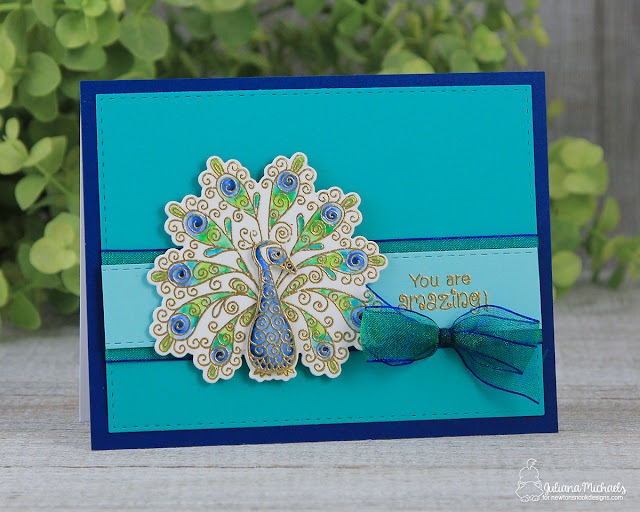 I recently shared a card using this same stamp set and technique during the recent Newton's Nook Designs April Release. On this card, I stamped the beautiful peacock image from the Beautiful Plumage stamp set using Versamark Watermark Embossing Ink and then heat embossed it using a copper embossing powder. After die cutting the image using the coordinating Beautiful Plumage dies, it was time to pull out the watercolor markers. I used Zig Clean Color Real Brush Marker in the following colors: Peacock Blue, Cornflour Blue, Persian Green, Emerald Green and Light Green. I added just a dab of color and then used a Kuretake Waterbrush to blend the colors. I allowed each color to dry before doing the next color. This helped separate the colors and keep them from all blending together. Another magical thing that I love about heat embossing is that it's great for containing the ink so you don't end up coloring outside the lines of your stamped image. This is a great technique for those of us who aren't experts at watercoloring. Thanks so much for stopping by today and I hope I've inspired you to pull out your watercolor paints, markers or even water based ink pads to give this fun technique a try! Hello friends and welcome to the fourth and final day of the Newton's Nook Designs April Release Blog Hop! 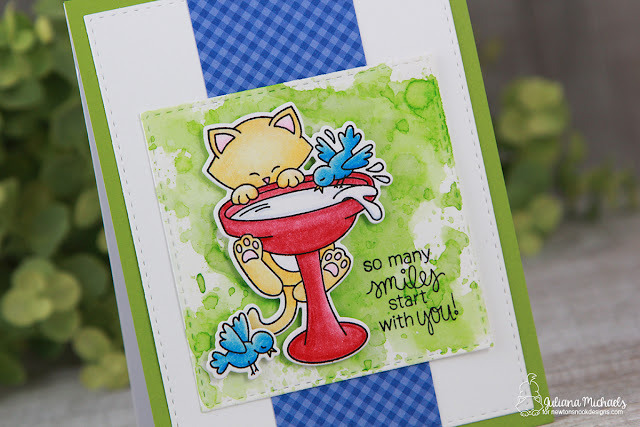 Today we're featuring the new stamp set and coordinating die set called Newton's Birdbath. 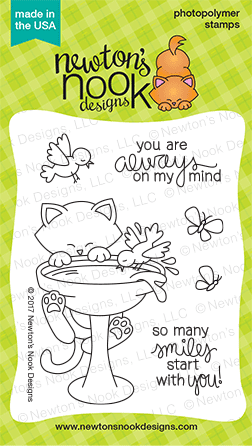 In this new stamp set, the ever adorable Newton is having a splashing good time playing in the water with the birds! 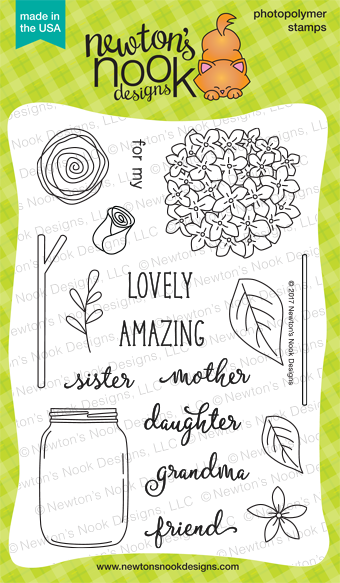 Just a reminder, all of the new products from the Newton's Nook Designs April Release will be available April 14! I pulled out my favorite coloring tools - my Prismacolor colored pencils and gave Newton a bright red birdbath to play in with his new feathered friends. To create the background, I used my new favorite technique - Smooshing! During the March release, I shared a quick tutorial on how to do this technique which I call the Distress Ink Smooshing Background Technique. Once all the inking and coloring was completed, I used the Newton's Birdbath coordinating dies, to die cut the images and popped them up using some double sided foam adhesive. So who's ready to have some fun? Would you like to win the “Newton's Birdbath” Stamp Set? This set will be given away to ONE lucky winner! For your chance to win, comment on the NND blog and each of the Design Team blogs. The winner will be chosen at random from the collective reveal posts. You won't know which blog has been chosen so the more you comment on, the better your chances are of winning! You have until Thursday April 13th at 9pm CST to comment -- winners will be announced on the blog post on Friday, April 14th. 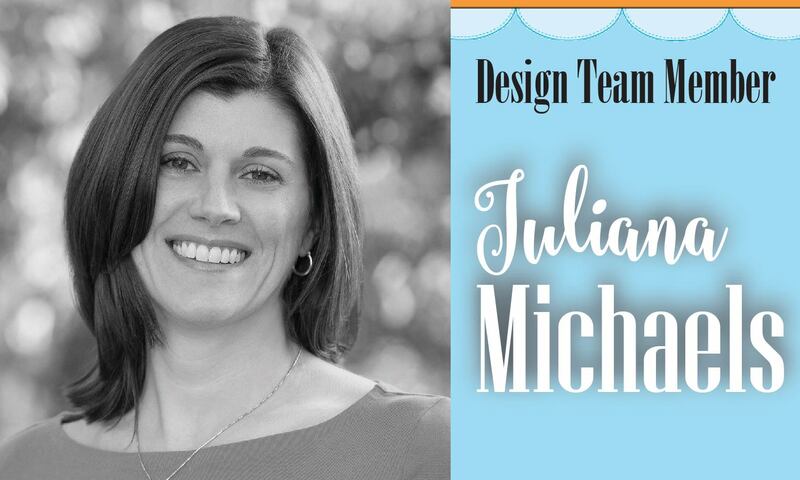 Check out all the awesome Design Team Blogs for more amazing inspiration and don't forget to leave a comment on each blog for a chance to win! If you're looking for the Gina K Designs Blog Hop Day 2, click here. Hello friends and welcome to Day 3 of the Newton's Nook Designs April Release Blog Hop! Today's new stamp set is called Simply Relative. 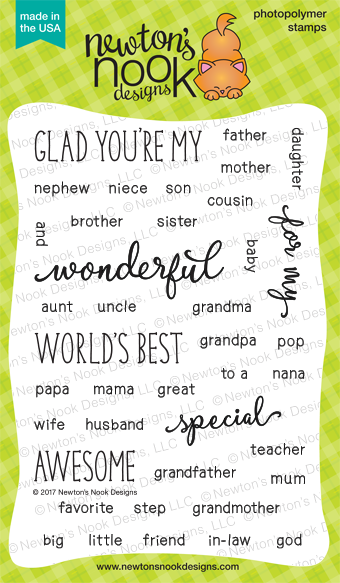 This stamp set features words in a variety of fonts to allow you to mix and match to create sentiments for every relative in your family. 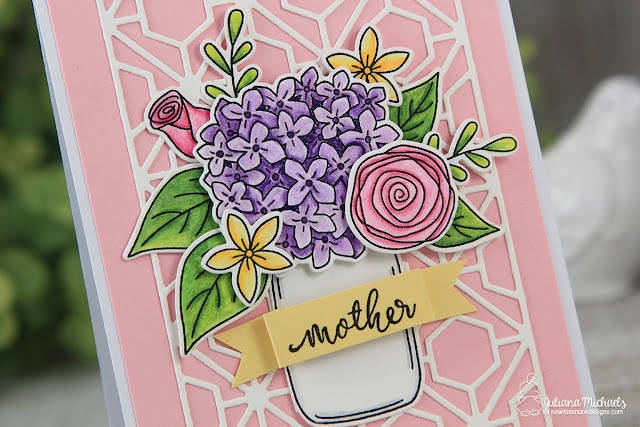 With Mother's Day coming next month, I was again inspired to create another Mother's Day card. This one is for my mother in law. 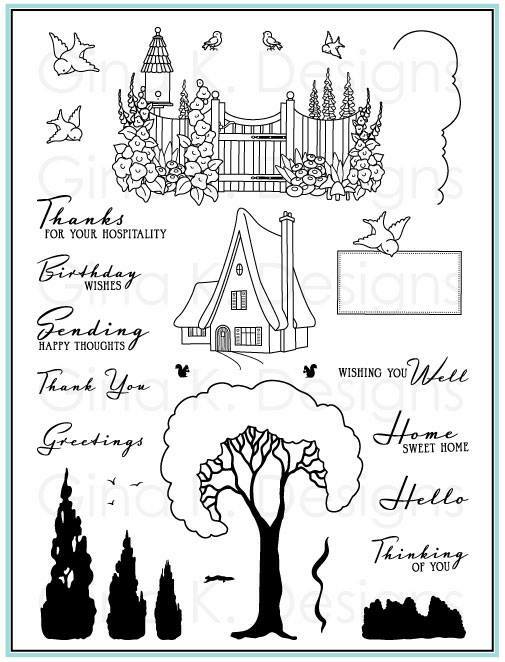 I began by stamping, coloring and die cutting flowers and leaves from the Lovely Blooms stamp set. Using double sided foam adhesive I layered the images to give them dimension as I adhered them to the card front. Speaking of the card front, if you look closely, you can see that I only embossed the top part of the white cardstock. I did this by only placing part of the paper inside the embossing folder. I then used my Scor Pal to add two horizontal lines to give me a space to stamp the sentiment. 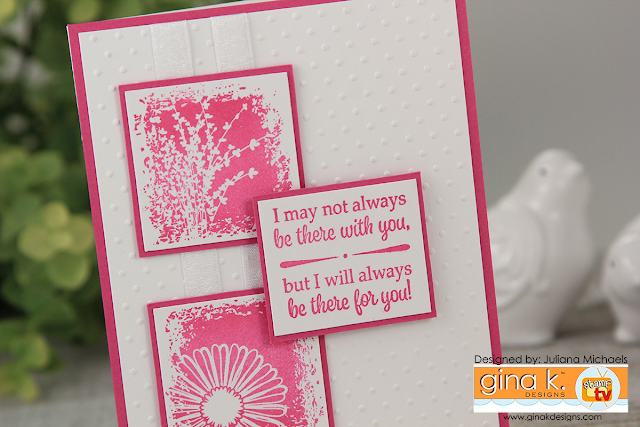 The sentiment is stamped using the new Simply Relative stamp set. I love how you can mix and match the words to create just the right combination. So, how would you like to win the Simply Relative stamp set? For your chance to win, comment on the NND blog and each of the Design Team blogs. The winner will be chosen at random from the collective reveal posts. You will not know which blog has been chosen so the more you comment on the better your chances are of winning! You have until Thursday April 13th at 9pm CST to comment -- winners will be announced on the blog post on Friday, April 14th. I have two blog post today. If you're here for the Newton's Nook Designs April Release Blog Hop, click here. Hello friends and welcome to Day 3 of the Gina K Designs April Release Blog Hop celebrating the new stamp sets by Gina K and the illustrator team from Gina K Designs! Today, we're featuring the My Anchor Mini Kit. This kit contains everything you need to create a set of elegant masculine cards including a beautiful stamp set, mini ink pads, cardstock, card bases, envelopes, patterned paper and adhesive. This kit is perfectly coordinated to allow you to create with ease! 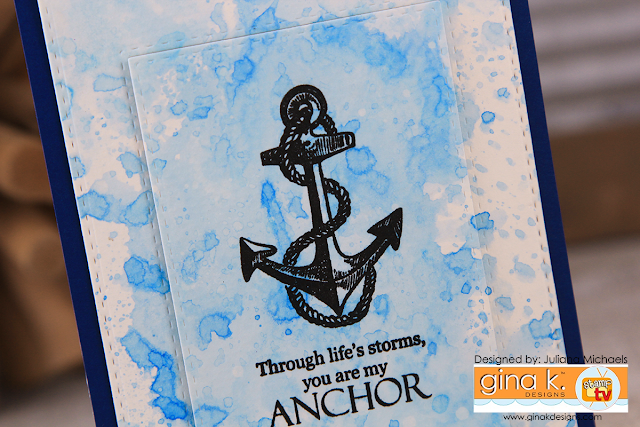 The stamps in this set are seriously perfect for making masculine cards and when I saw the anchor image and sentiment, I knew who I wanted to create a card for...my husband! The anchor of course made me think of water and I thought it would be fun to create a water splashed background using the smooshing technique. For this technique, you simply "smoosh" an ink pad onto a craft mat, spritz it with water and then use your finger to mix the ink and water together. 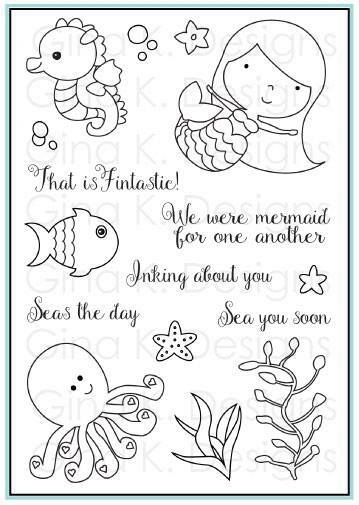 Next, "smoosh" your paper onto the water and ink. Allow it to dry between each application (you can use a heat tool to speed up the drying process). This will allow you to build up the layers of color. Repeat the "smooshing" to get the amount of coverage you desire. Ok! Are you ready for more amazing inspiration from Gina and the rest of the Cast & Crew? Just click on the links below and leave a comment on each blog for your chance to win a $20 Gina K Designs gift certificate! To see who won, make sure to visit the Big News Forum at StampTV a few days after the hop. Do you want to see all the new products available this month? Visit the Gina K Designs Store and click on the “What’s New”. Thanks so much for stopping by and I hope you have a wonderful hop! 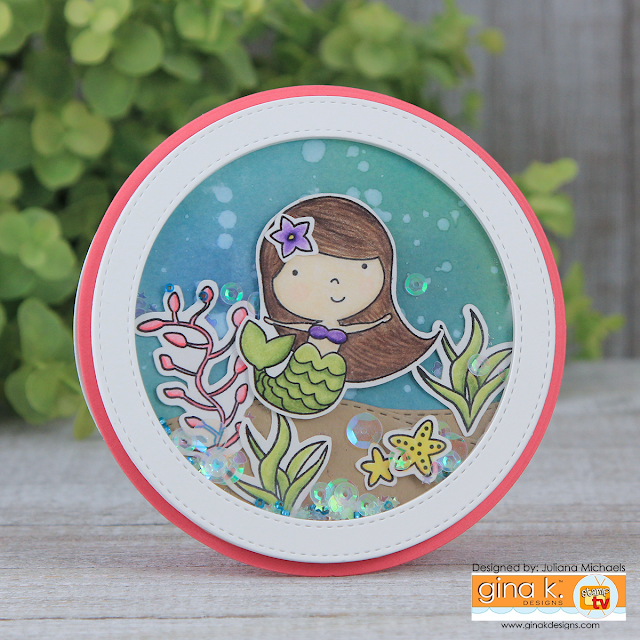 Hello all and welcome to Day 2 of the Newton's Nook Designs April Release! 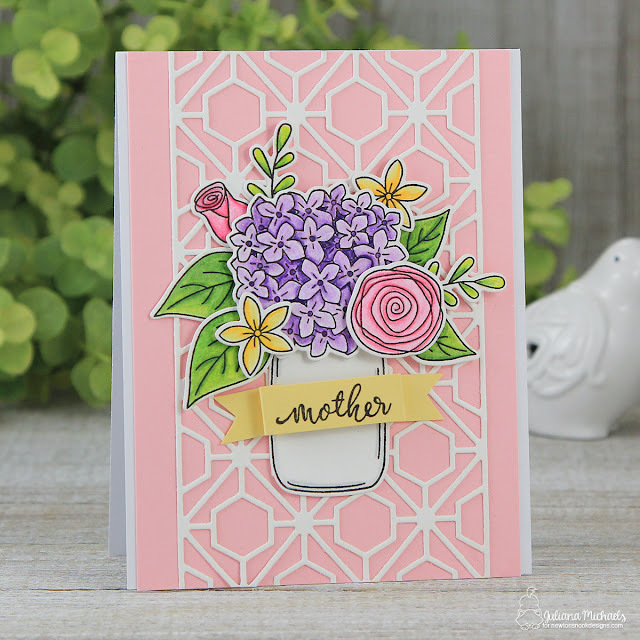 Today we're revealing the new Lovely Blooms stamp and coordinating die set. This set is packed with lovely blooms perfect for making a wide variety of floral arrangements and bouquets. And of course, perfect for creating Mother's Day cards! As we all know, Mother's Day is next month and this beautiful set inspired me to create a card for my Mother. 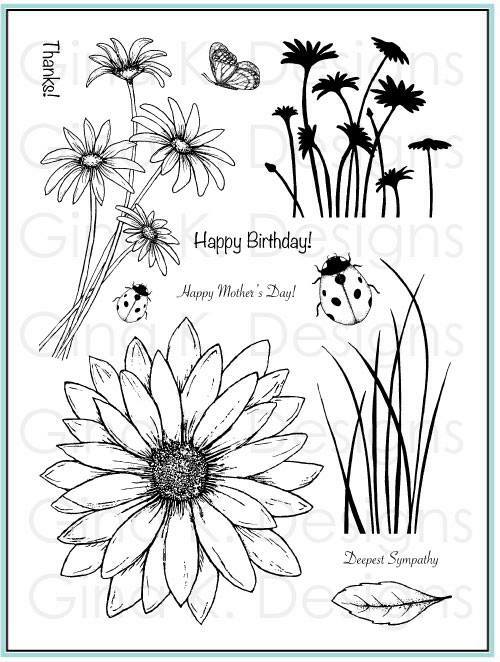 To create my card, I stamped the flowers and leaves from the Lovely Blooms stamp set with Versafine Ink in Black Onyx. Once the ink was dry, I colored them using Prismacolor colored pencils and then blended them using a blending stump and Gamsol. Next, I die cut all of the images using the Lovely Blooms coordinating dies and then layered them using double sided foam adhesive to give it a more dimensional look. The banner for the "mother" sentiment is a strip of cardstock trimmed to length. I used my Scor-pal to add the folds and then adhered it on top of the mason jar image using double sided foam adhesive. 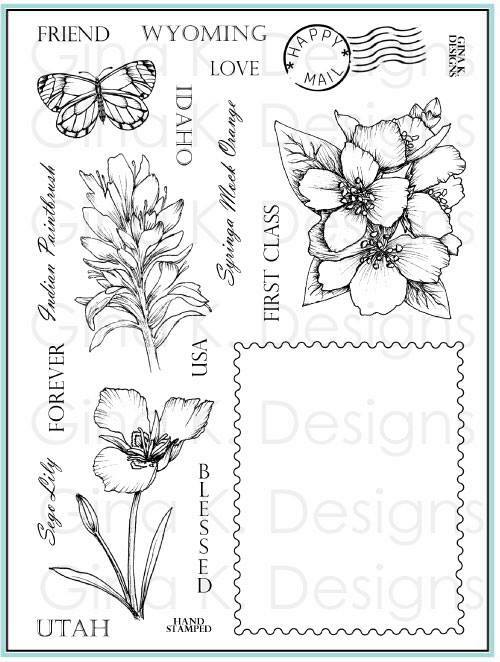 Now that you've seen the Lovely Blooms set in actions, how would you like to win this stamp set? Newton's Nook will be giving this set away to ONE lucky winner! To win, all you have to do is comment on the NND blog and each of the Design Team blogs (see the list below). The winner will be chosen at random from the collective reveal posts. You will not know which blog has been chosen, so the more you comment on the better your chances are of winning! You have until Thursday April 13th at 9pm CST to comment -- winners will be announced on the blog post on Friday, April 14th. I have two blog post today, so if you're here for the Newton's Nook Designs April Release Blog Hop Day 2, click here. Hello friends and welcome! It's Day 2 of the April Release Blog Hop celebrating the new stamp sets by Gina K and the illustrator team from Gina K Designs! Today, we're featuring the stamp sets Vicky Mermaid by Beth Silaika, Cottage Garden by Claire Brennan and the Botanical Blocks Incentive Set. Incentive sets are stamps sets that ship free with any $75.00 order and is automatically added to your cart. For more information click here. When I first saw the Vicky Mermaid set, I knew I had to make a shaker card! I stamped and colored Vicky, the starfish and the coral with Prismacolor colored pencils. 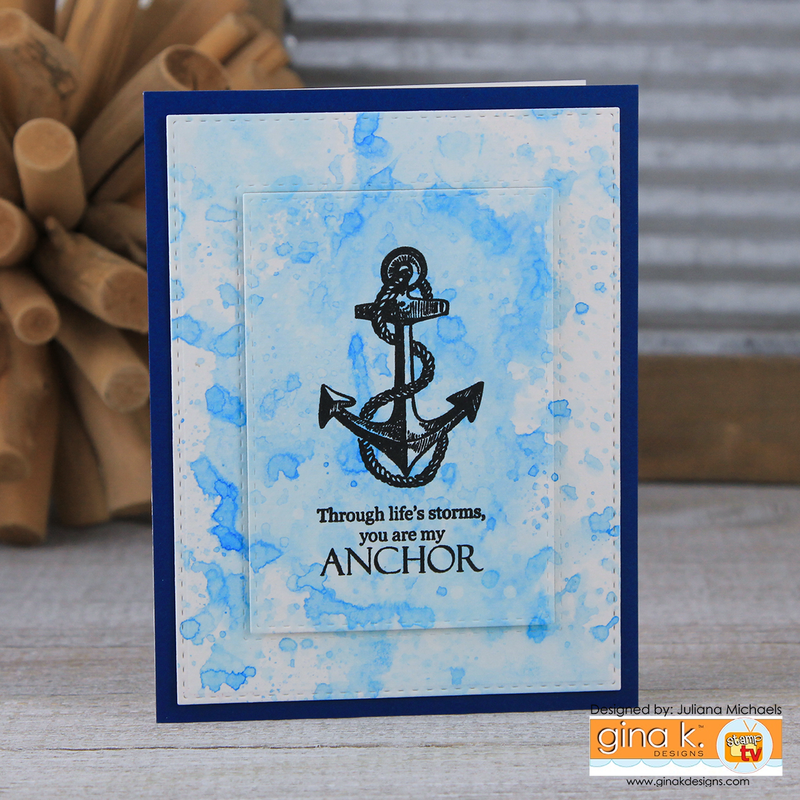 The background was created using a mix of Distress Oxide inks. I filled the inside of the shaker with sequins and seed beads. Seed beads are one of my new favorite things to use in a shaker card because they add some noise to the shaker and make it even more fun. For my second card, I colored the fence scene from the Cottage Garden set. I again used my Prismacolor colored pencils. As you will notice, this is my go-to coloring choice! I love the little banner with the bird and that many of the sentiments will fit inside the banner he is holding. To give the entire scene a little dimension, I used double sided foam adhesive. 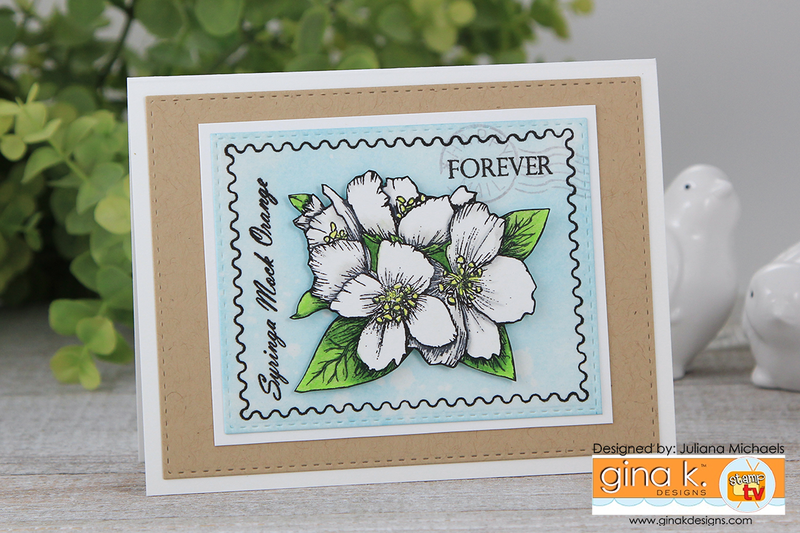 My final card for today features the Botanical Blooms Incentive Set. I stamped two of the floral images and then punched them out using a square punch. 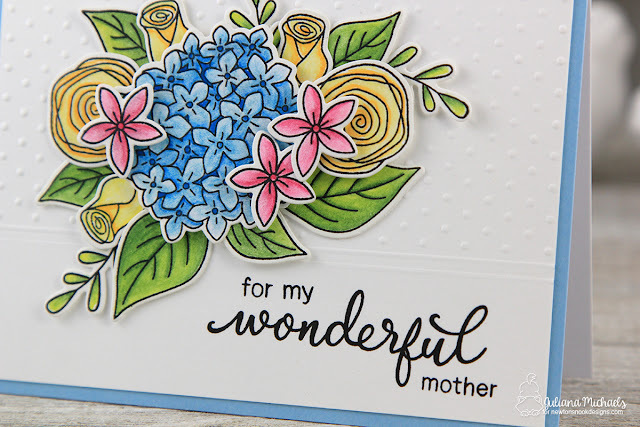 I used this same technique for the sentiment, but trimmed off a bit of the top and bottom on the square to allow it to stand out a bit from the stamped floral images. Now it's time to hop! 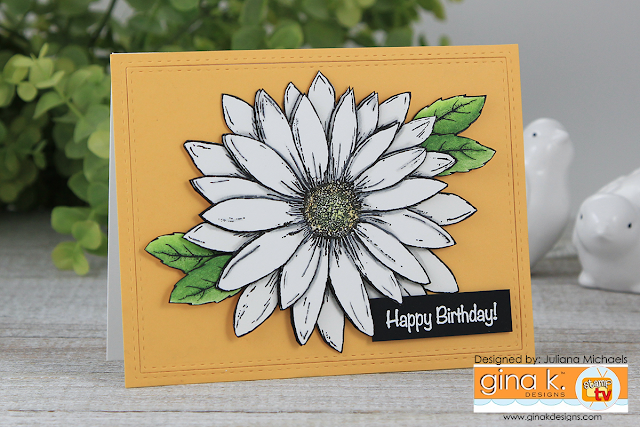 I invite you to enjoy the amazing inspiration samples from the rest of the team by clicking on the links below and then leave a comment on each blog for your chance to win a $20 Gina K Designs gift certificate! To see who won, make sure to visit the Big News Forum at StampTV a few days after the hop. Would you like to see all the new products available this month? Visit the Gina K Designs Store and click on the “What’s New”. Thanks so much for stopping by and happy hopping! 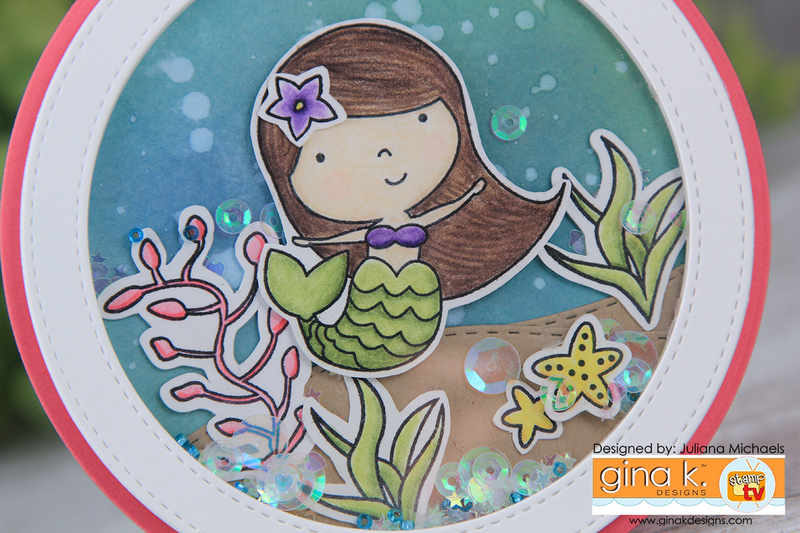 If you're looking for the Gina K Designs Blog Hop, click here. 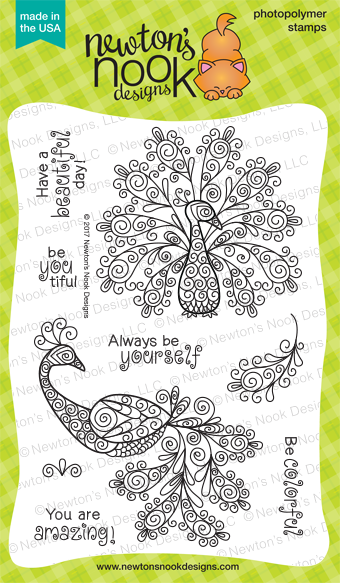 Hello friends and welcome to Day 1 of the Newton's Nook Designs April Release! 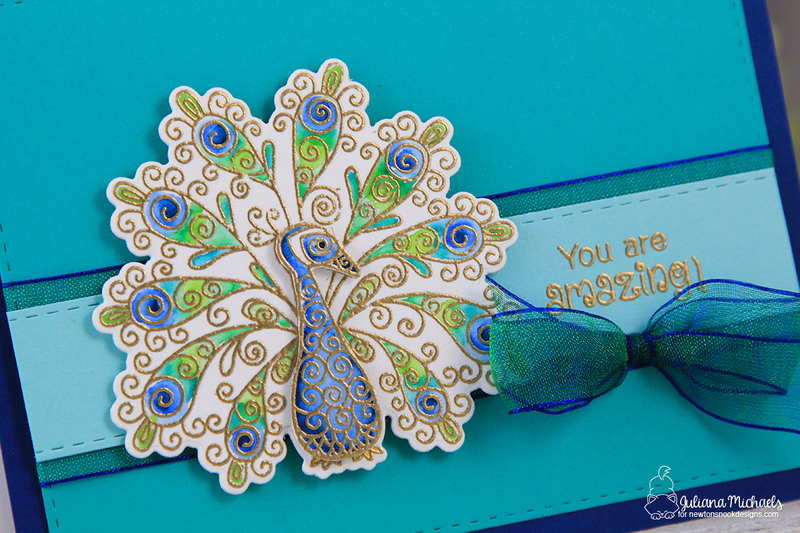 Today we are revealing the gorgeous new Beautiful Plumage stamp and coordinating die set. This set is another addition to the Beautiful Swirls series. The swirly designs are just perfect for a pair of beautiful peacocks! Don't you agree? I began by stamping the peacock image from the Beautiful Plumage stamp set with Versamark Watermark Embossing Ink twice onto watercolor paper and heat embossed it with gold embossing powder. To cut out the images, I used the coordinating Beautiful Plumage dies to die cut one of the images and then I fussy cut just the body of the other image. More on what I did with those two pieces in a bit! Using double sided foam adhesive, I adhered the fussy cut peacock body onto the full image to give it a little bit of dimension. I stamped the sentiment and heat embossed it with gold as well. The card is finished off with the addition of a bit of die cut cardstock and a bow. Now, let's get to the fun stuff! Would you like to win the “Beautiful Plumage” Stamp Set? If you want to win it, all you have to do is leave a comment on the NND blog and Design Team blogs! The winner will be chosen at random from the collective reveal posts. You will not know which blog has been chosen, so the more you comment on the better your chances are of winning! You have until Thursday April 13th at 9pm CST to comment -- winners will be announced on the blog post on Friday, April 14th. 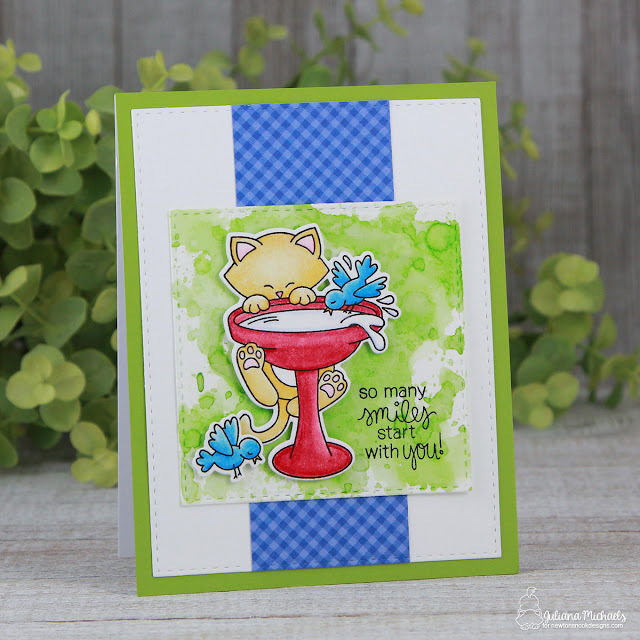 If you are here for the Newton's Nook Designs April Release Blog Hop Day 1, click here. Hello friends! I'm thrilled to share that the Cast & Crew (which includes me!) 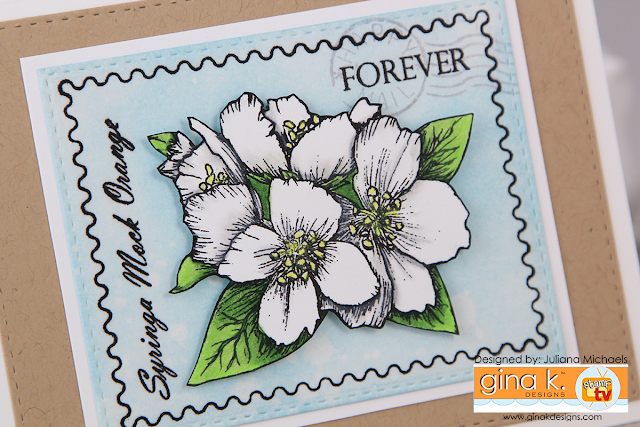 for Gina K Designs welcomes you to Day 1 of the April Release Blog Hop celebrating the new stamp sets by Gina K and the illustrator team from Gina K Designs! Today, we're featuring the stamp sets Stately Flowers 11 by Melanie Muenchinger and Daisy Delight by Theresa Momber. I'm also super excited to announce that starting this month I'm a new member of the Design Team for Gina K Designs - affectionately known as the Cast & Crew! 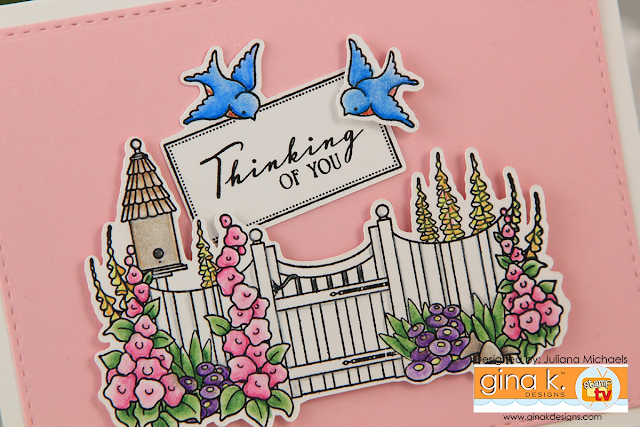 Each month I'll be bringing you inspiration using the latest release from Gina K including her beautiful stamp sets and stamps kits! Are you ready for some inspiration? First up, I bring you a card I created using the Stately Flowers 11 by Melanie Muenchinger. One of my favorite stamps in this set is the little Happy Mail post mark image. I stamped the stamp outline image and word stamps onto a piece of watercolor paper and then added some color using a foam blending tool and ink. Next, I stamped the floral image onto white cardstock and colored it with Prismacolor colored pencils. I then got a little crazy and fussy cut the floral image. To give the image a little dimension, I adhered it to the card front using double sided foam adhesive. My second card features the Daisy Delight stamp set by Theresa Momber. I just love this large daisy image and couldn't resist making it the center of attention. I stamped and fussy it cut it to create two layers. I then added some shadow highlights and colored the center and leaves with Prismacolor colored pencils. 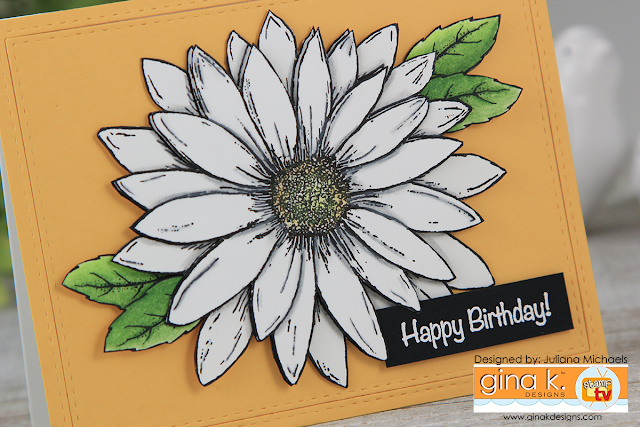 Using double sided foam adhesive, I adhered the daisy layers and leaves to the card front. 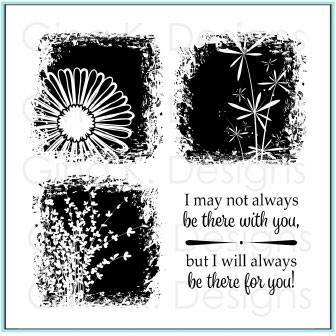 I stamped the sentiment onto black cardstock and embossed it with white embossing powder. Now, let's get this hop started! Just click on the links below and don't forget to leave a comment on each blog for your chance to win a $20 Gina K Designs gift certificate! To see who won, make sure to visit the Big News Forum at StampTV a few days after the hop. 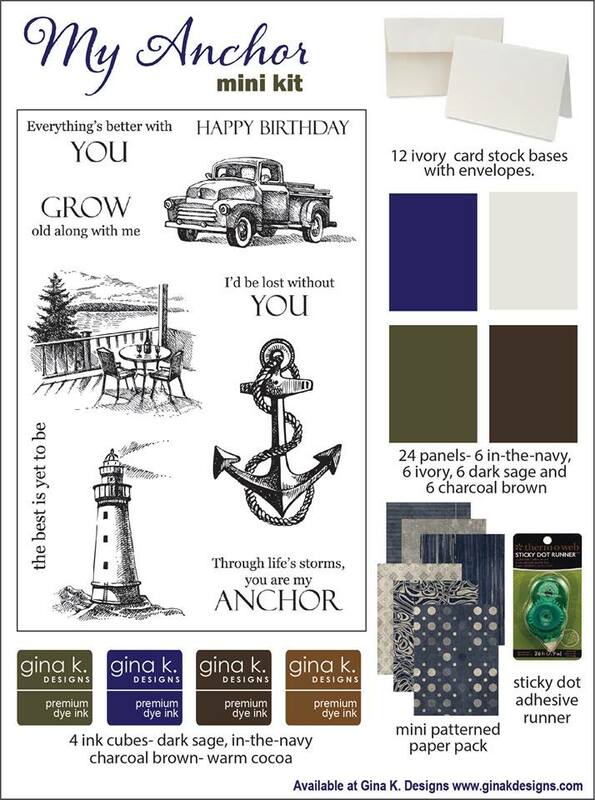 To see all of the new products available this month from Gina K make sure to visit the “What’s New” section at Gina K Designs! Thanks so much for stopping by today! Happy Monday! Did you all enjoy the Spring Coffee Lovers Blog Hop? I know I did and will continue to as I slowly make my way through looking at all the amazing projects and inspiration. Today, I want to share the winner of the awesome prize package donated by Jillibean Soup. The winner is Debbie McNamee! Congratulations Debbie! And a big thank you to everyone who left a comment and stopped by here during the hop!